Heroes & Dragons Comics Club: TONIGHT @ THE VILLA: CIVIL WAR!!!! In case you didn't know, tonight at 7:30pm at the Villia the H&D Comics Club will be meeting for our discussion on Civil War. Call (803) 731-HERO (4376) for directions and meeting times. 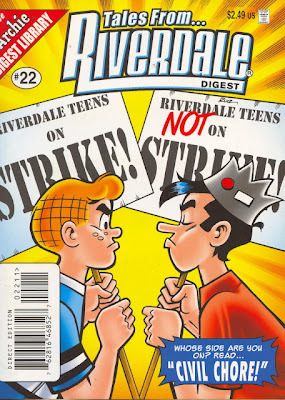 To forewarn you, Chris and I will be talking about how the best thing to come out of Civil War was Archie Comic's Civil Chore!